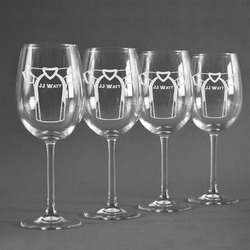 Give your home bar an update with our must have personalized wine glasses. Custom / personalized wine glasses are guaranteed not only make you smile with each sip, because the glasses reflect your personal style (classy, sassy or whimsical), but will also impress your friends and family when you entertain. Our wine glasses are a nice size bowl (21 oz), so your wine (red or white) has plenty of room to breath, swish and swirl around. The stem and bowl are well proportioned, so you can hold the wine glass by the stem or the bowl. The slight inward curve helps focus the aromas. 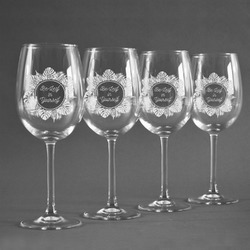 The set includes 4 wine glasses that will be custom engraved with your design. 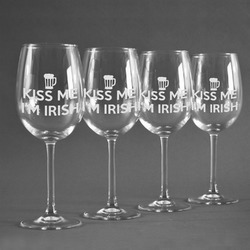 Each glass holds 21 oz and measure 9"H x 3.5"W.
You can have all four glasses engraved with the same design or you can customize and personalize each glass individually - the choice is yours!! You can start by browsing our design and customize one if you like it or you can design your own glasses. Our customization system makes it easy for you to add text, graphics, monograms, sayings. We have a huge collection of art and fonts for you to choose from. Contact us if you are unable to find what you are looking for.